Scott Walker on immigration: "My view has changed"
Now that he's gearing up for a possible presidential campaign,Wisconsin Gov. Scott Walker is already walking back beliefs he held just two years ago, on the flashpoint subject that has Congressional Republicans -- including the party's leadership -- in knots. Dash to 2016: Is presidential hopeful Gov. Scott Walker being too risk-averse? "My view has changed. I'm flat out saying it," Walker said on FOX News Sunday, addressing progressive immigration policies that he once favored. "Candidates can say that." Walker was responding to a grainy Wausau Daily Herald video from two years ago showing the young governor, shirt sleeves rolled up, answering a pointed question about a path to legal status for undocumented immigrants. "Can you envision a world where with the right penalties and waiting periods and meet the requirements, where those people can get citizenship?" a reporter asks off-screen. In the clip, the governor responds simply: "Sure, yes. I mean, I think it makes sense." Walker rejected the idea that he was supporting "amnesty" at the time. "I don't believe in amnesty," Walker said. "And part of the reason why I made that a firm position is I look at the way that this president has mishandled that issue." Against pointed questioning, Walker continued his defense by mentioning his record challenging the constitutionality of Obama's immigration order. "I was one of the first governors that joined the lawsuit that has been successful, at least on this initial technicality," the Wisconsin governor said. "And I hope we prevail ultimately throughout the courts." 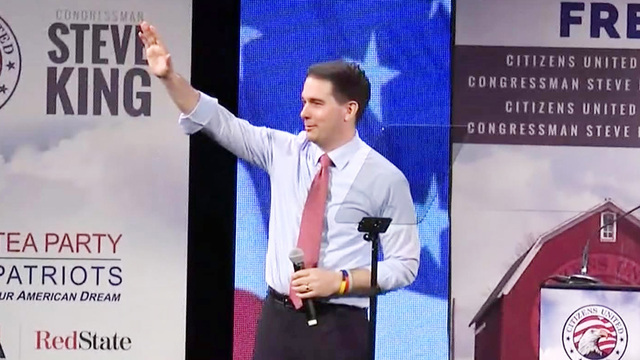 Walker's appearance on the cable show followed the weekend's close second-place finish in the annual Conservative Political Action Conference (CPAC) straw poll. The conference -- a three-day conclave that gathers together the more grassroots wing of the Republican party -- chose, for the third year in a row, Kentucky Sen. Rand Paul as its clear favorite. But Walker, the crown prince of CPAC to Rand Paul's king, didn't do too shabby: the 2016 hopeful raked in just over a fifth of the votes, and jumped 7 percentage points from last year's ranking. Though his performance reviews weren't all overwhelmingly positive -- he suffered a setback after comments that seemingly compared terrorist threats like ISIS to the union protesters he fought during his time as Wisconsin's chief executive -- he came out of the Maryland weekend as more a conservative darling than a dud. Bloomberg Politics' Mark Halperin on "Face the Nation" Sunday declared Walker one of the leaders in an otherwise wide-open Republican nominee field. "I learned talking to people at CPAC -- I think there's two frontrunners now: Walker and Bush," Halperin said.